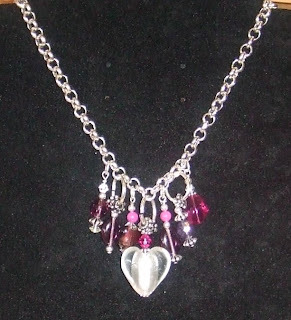 A simple charm necklace, including swarovski and silver lined venetian glass. Wow Tracy this is stunning been having a good look at yours and Jackie's blog what fantastic jewellery I sooooo love this one - am interested in where you get your bits and bobs from - I've just started playing with making some jewellery and went to Hobbycraft (more impatience than anything as I know they expensive) and any good tips for a beginner??? I love this, how clever of you! !